For bigger and better tasting crops of beautiful berries. Provides a steady supply of natural nutrients to promote strong, healthy growth. Encourages better fruit set and bigger yields. Ideal for tubs and growing bags and also for other soft fruits. Supplied as a 1L bottle of liquid feed. A concentrated high potash liquid feed containing naturally occurring nutrients and essential trace elements. 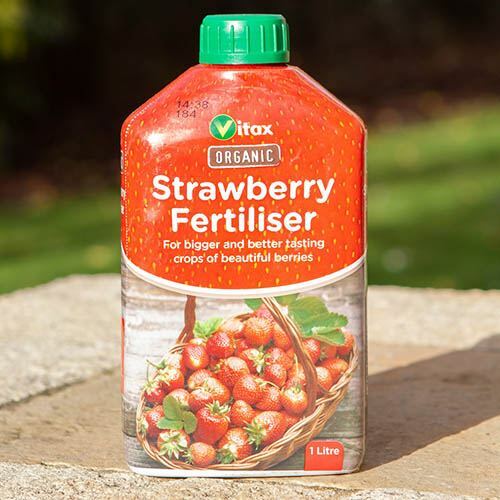 Vitax Organic Strawberry Fertiliser provides a steady supply of natural nutrients promoting strong healthy growth and increased yields. Ideal for use in strawberry tubs. Also suitable for other soft fruits. From planting out feed at weekly intervals, 1 litre (2pints) of diluted feed per bag, gradually increasing to 4.5L (1 gallon) per week after the first fruits have set. Under cover, increase application frequently to twice a week after the first fruits have set. Apply 2 litres (½ gallon) of diluted feed per plant every 14 days, rising to once every 7 days after the fruits have sent. When fruits have set apply 2 litres (½ gallon) of diluted feed per plant every 7 days.